Overview: Cyber Research & Training Institute popularly known as CRTI (Registered under Society’s Act) emerged as a well knit organization with a vision to promote excellence in the field of Computer Science, Biotechnology and Management Studies in multisectoral and multidisciplinary perspectives. The framers of this Institute dreamed to implement the best of academic practices, so as to produce successful and enterprising professionals for taking up future challenges under globalised market economy. It is a matter of great pride that the hard labour has paid and CRTI has become a dream-come-true establishment in reality to cherish. Being proud of its large infrastructural facilities with a total area of 24000 sq.ft., the Institute stands centrally at Burdwan town. The Railway Station within a five minute walking distance, the main market in close vicinity and the adjacent bus stand are added advantages and thus the Institute extends facilities to all in every possible ways. 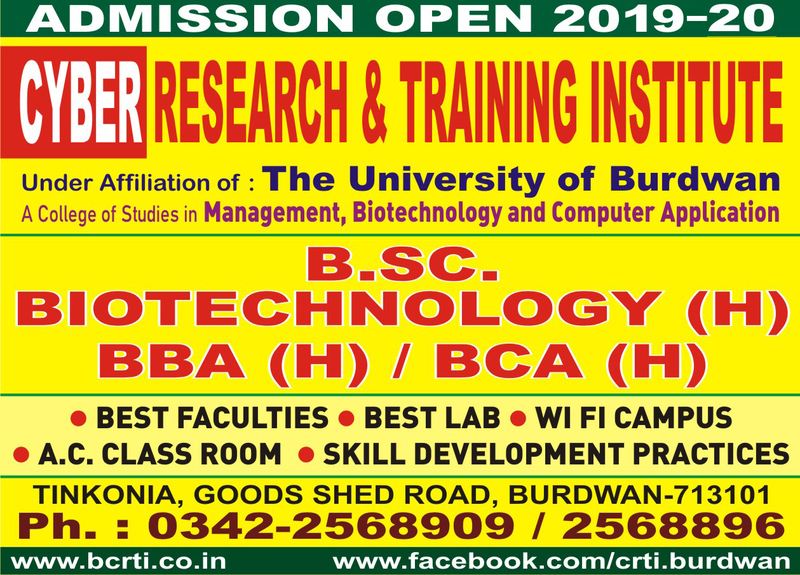 The Institute is presently conducting and 3 years Honours degree courses in Bachelor of Business Administration (BBA), Bachelor of Computer Application (BCA), Bachelor of Science in Biotechnology (B.Sc. Biotech) under the affiliation of The University of Burdwan with many more new courses likely to be added from the current academic session. Besides above short-term vocational courses on Hardware and Networking and Financial Accounting (FA), DTP, Multi Media Courses under the affiliation of West Bengal State Council of Technical Education (W.B.S.C.T. & VE & SD.) The Institute is designed in a congenial environment to develop one's own abilities under the constant guidance of a team of well-qualified, dedicated and experienced Faculties. The Management insists on a strict code of conduct for students and teaching staff fostering quality keeping in parity with the fundamentals of good education to contribute a better society of tomorrow. The institute is situated at the heart of Burdwan town from year 2000 and provides large infrastructural facilities with an existing furnished area of 24000 sq. ft. and an adjoining free space of 10000 sq. ft. It stands adjacent to G.T.Road, Tinkonia Bus Stop and Burdwan Railway Station. Copyright © bcrti.co.in. All rights reserved.